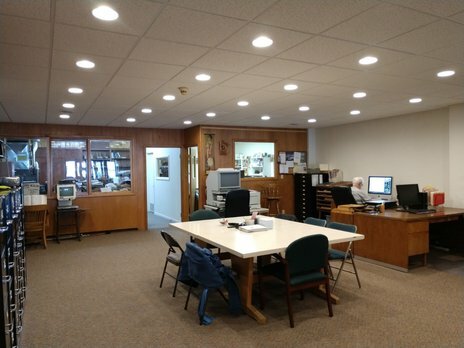 The expanded library has a wealth of information for anyone interested in local history or genealogy. The use of the library cost $2 and there are additional fees for any copies made. All materials must be used on site. Effective on August 26th 2002, a written policy for research was adopted by the Historical Society Board of Trustees. .25 cents each copy- 8.5" x 11"
.50 cents each copy- 11" x 17"
$3.00 per photograph scanned on disk or paper. Research requests must include specific information such as names and/or dates. All mail in and telephone requests will be charged $10.00 per hour with minimum charge of $10.00. Photocopies will be billed at the appropriate rates indicated above. A meeting room with the capacity of 80-100 is available for rent to small groups for various gatherings including business meetings, birthdays, graduation receptions, etc. The room includes the catering kitchen, television, DVD player, and a large screen. Call 507-831-1134 for more rental information.